Until solid state electronics had supplanted the majority of vacuum tube type televisions and radios, portable tube testers were essential equipment to successful, efficient troubleshooting and repair in businesses and people's homes. Yep, believe it or not the stories told about doctors and electronics repairmen visiting homes are not just fables. I remember as recently as the 1960s having our family doctor make house calls when I or one of my fours sisters got sick. Both doctors and TV servicemen ceased the practice at about the same time - probably the result of a Brotherhood of Electronics Technicians and General Practitioners collective bargaining agreement ;-) Many column inches of editorials, articles, comics, and letters to the editor were devoted to the trials and tribulations of in-home servicemen and the experiences they had dealing with customers. 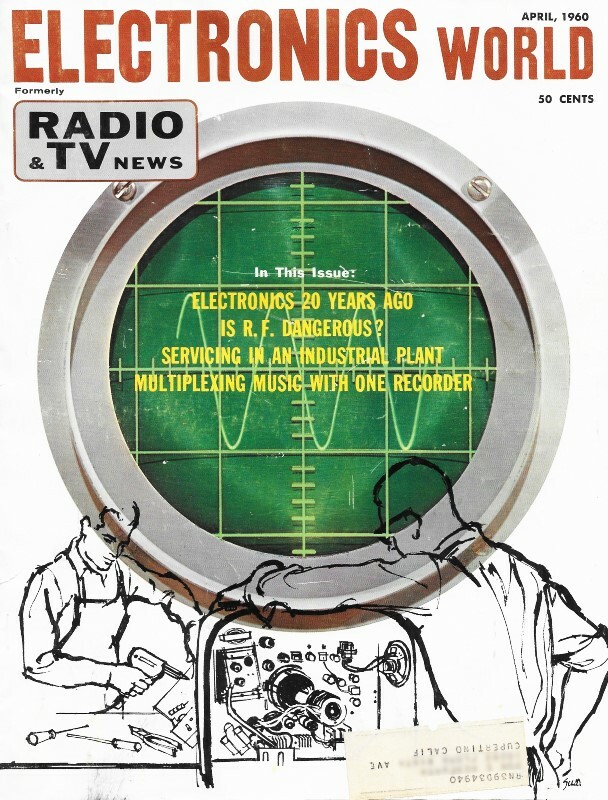 Do a search of television radio service on RF Cafe and you'll find lots of examples from my collection of vintage electronics magazines. 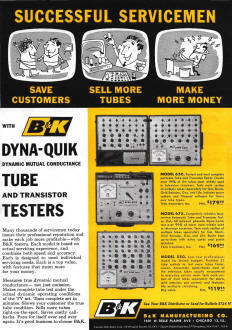 This advertisement for B&K Manufacturing's line of vacuum tube testers is from a 1960 issue of Electronics World. 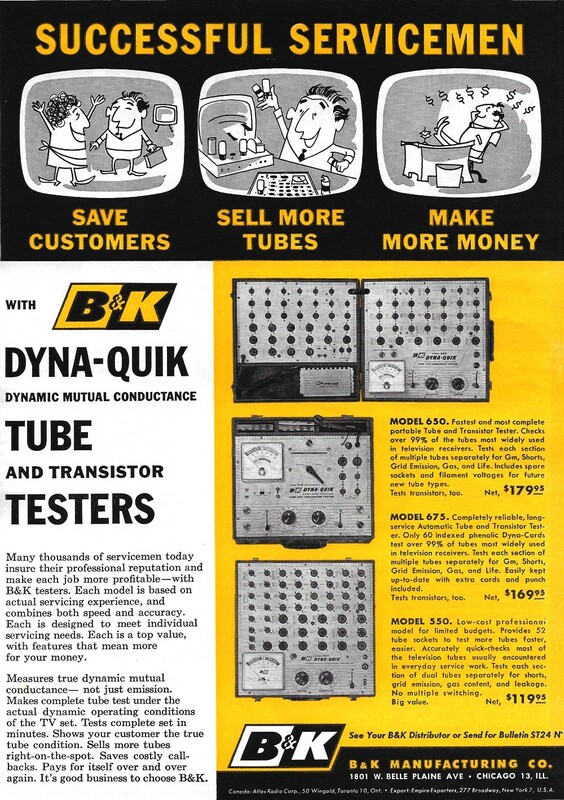 I still have a B&K Dyna-Quik Model 650 vacuum tube tester (top photo in ad below) given to me in the 1980s by über engineer Jim Wilson when I worked as a technician at Westinghouse Electric Corporation in Annapolis, Maryland. The $179.95 cost in April 1960 is equivalent to $1,537.13 today (2018), per the BLS Inflation Calculator. Many thousands of servicemen today insure their professional reputation and make each job more profitable - with B&K testers. Each model is based on actual servicing experience, and combines both speed and accuracy. Each is designed to meet individual servicing needs. Each is a top value, with features that mean more for your money. Measures true dynamic mutual conductance - not just emission. Makes complete tube test under the actual dynamic operating conditions of the TV set. Tests complete set in minutes. Shows your customer the true tube condition. Sells more tubes right-on-the-spot. Saves costly call-backs. Pays for itself over and over again. It's good business to choose B&K. Model 650. Fastest and most complete portable Tube and Transistor Tester. Checks ever 99% of the tubes most widely used in television receivers. Tests each section of multiple tubes separately for Gm, Shorts, Grid Emission, Gas, and Life. Includes spore sockets and filament voltages for future new lube types. Model 675. Completely reliable, long-service Automatic Tube and Transistor Tester. Only 60 indexed phenolic Dyno-Cards test over 99% of tubes most widely used in television receivers. Tests each section of multiple tubes separately for Gm, Shorts, Grid Emission, Gas, and Life. Easily kept up-to-date with extra cords and punch included. B&K Manufacturing Co. 1801 W. Belle Plaine Ave. Chicago 13, Ill.
Canada Atlas Radio Corp, 50 Wingold, Toronto 10, Ont.